Today was a good mail day. I got the most recent newsletter from CBBAG. I like getting these and reading about what's going on with CBBAG; it makes me feel like I'm part of the group...even though everything they do is in Toronto so it's too far away for me to play. 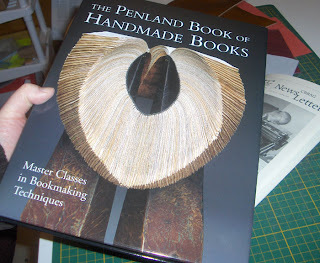 But also, I got the The Penland Book of Handmade Books today! We had a Chapters gift certificate that had been lingering for a few months and nearly forgot about; sheesh, I don't understand how I could let that happen. So I finally used it to buy this and it arrived today. I haven't had much time to look at it. My little boy was quite disappointed with the mail today and when he saw what I got, I think he knew it could take me away for hours, so he wouldn't tolerate anyone looking at it for more than a few minutes. I didn't realize that with each of the featured artists, the book also includes a how-to-do-something-that-they-do section, so that is a nice treat. I'll have some new things to try, can't wait! This is one of my favourites. I can just see you working your way through it. I know you'll have fun. You've actually inspired me get my copy of Archaeology of Medieval Bookbinding off the shelf again. I LOVE this book. I look at my copy all the time. 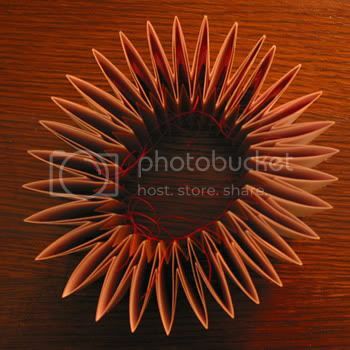 Now I am waiting for 500 Handmade Books by Lark Publishing to come out this summer. I'm dying to see the books and artists they include. I've been eyeing this book when I was in Singapore a year ago. And I was just there last week and bought it! Altho it was a toss up with another book I can't remember what it was now... and decided to go for this one instead.